Simply put, coordinate adjectives are descriptive words that like to work in groups. They're two or more adjectives that band together to modify the same noun. These adjectives are separated by the word "and" or with commas. In just a moment, you'll have the complete answer to the question, "What are coordinate adjectives?" 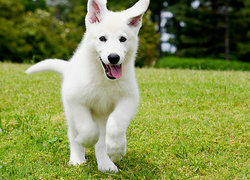 It's a happy and lively puppy. It's a happy, lively, and well-behaved puppy. Here, we're still looking at an example of coordinate adjectives. This time, however, they're separated by commas and the word "and." When there are more than two modifiers, we need to use commas to separate the descriptors. It's a happy, lively and well-behaved puppy. This, too, would be acceptable. It all comes down to the infamous Oxford comma. With coordinate adjectives comes one of the most hotly debated topics in the English language. The Oxford comma, or serial comma, is placed in a series of three or more items. Some language experts use it, others don't. In this example, the lack of the second comma doesn't change the meaning of the sentence. However, in other instances, the lack of a comma could misconstrue a sentence's meaning. We awoke to the sound of cheerful and perky songbirds. What a gratifying and productive day. Our mountain cabin was surrounded by a burbling, gurgling creek. I simply could not put down that thrilling, cinematic, and suspenseful book. The rusty, creaking, spider-ridden, ugly tractor rotted away in their backyard. Note our third example about the burbling, gurgling creek. There, we had two adjectives but we didn't separate them with the word "and." Rather, we just used a single comma. This, too, is acceptable when using coordinate adjectives. As long as both descriptors are independently modifying the same noun, you can choose between a comma or the word "and." The first example about the cheerful and perky songbirds is equally acceptable. She loves to write with her red fountain pen. It seems like "red" and "fountain" are both modifying "pen," and should make use of the word "and" or even a comma. However, "red" is modifying the phrase "fountain pen." "Fountain" isn't modifying "pen." If you're uncertain if you're working with coordinate adjectives, take the words in question and place "and" between them. If it doesn't make sense, you're dealing with a good ol' fashioned descriptive adjective and not a coordinate adjective. There's one thing to note about the order of coordinate adjectives. Their order isn't set in stone. Rather, it's subject to the writer's preference. These adjectives can independently modify the noun and are, usually, of equal importance. In the puppy example above, the writer might find each characteristic of the puppy to be of equal measure. As for the order, it would not change the meaning if it read, "It's a lively, happy, and well-behaved puppy." We love to dance to our favorite country ballads. Changing the order of "favorite" and "country" would not only change the meaning but also make the sentence appear illogical. Coordinate adjectives are a great addition to our writing. They help us paint illustrative pictures readers will appreciate. Like our friend, the adverb, you don't want to inundate your sentences with modifiers. They tend to take away from the fluidity of a line of text. But, if they'll help you paint a scene then, by all means, have at it! Coordinate adjectives bring commas to the forefront of the conversation. To be sure you're a master of this related tool, check out 8 Times Commas Were Important. Keeping your comma game on point will help you paint those illustrative scenes with accuracy and clarity. Coordinate adjectives: A happy, lively, and well-behaved puppy. "What Are Coordinate Adjectives?." YourDictionary, n.d. Web. 25 April 2019. <https://grammar.yourdictionary.com/grammar/adjectives/what-is-a-coordinate-adjective.html>.